The company started in a very humble way from Kenneth (now Sir Kenneth) Corfield's house in Lonsdale Road. Sir Kenneth had been interested in photography since the age of ten when he acquired a Kodak box Brownie camera. Photography became his hobby, but a schoolboy's pocket money didn't go very far, so he built his own enlarger, mixed his own processing chemicals and used out of date government surplus photographic paper. He was a pupil at Elmore Green High School in Bloxwich and even at that early age had developed a high level of initiative. He grew up in Walsall and so it was a natural step to join Walsall Photographic Society. He used to enter his prints in their competitions and at the age of 16 he won first prize for a photograph of roses covered in dew. Where it all began. 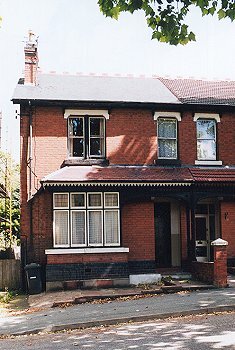 Sir Kenneth's old house in Lonsdale Road. When Sir Kenneth left school he decided to go into engineering. He was inspired by his grandfather, who built up a successful business as an iron-founder. At the age of sixteen and a half he joined Fischer Bearings, initially as an apprentice, and later as a management trainee. Whilst there he obtained a diploma in Mechanical Engineering at Wolverhampton and Staffordshire College of Technology, which gave him a good knowledge of mechanical and electrical engineering. By now the family had moved to Wolverhampton, and in 1947 Sir Kenneth read an article in 'Miniature Camera Magazine', which described the construction of an accurate enlarger exposure meter. It compared light from a spot-source on a negative with light from a reference source, in this case a torch. He built an experimental version which worked extremely well, and demonstrated it during a lecture he was giving on developing and enlarging to Walsall Photographic Society. The people in the audience were extremely enthusiastic about the meter, which was not only accurate but could greatly reduce wastage of expensive photographic paper and chemicals. One member of the audience, who was connected with the photographic trade, even asked if he could buy one; but the answer of course was 'no'. Word did quickly get round and Sir Kenneth was approached by a gentleman from a company who wanted to manufacture it . While considering the offer, Sir Kenneth realised that if the company could make money from manufacturing it, so could he. The next step was to completely redesign the crude prototype into a high quality product that could easily be manufactured and sold at a reasonable price. It took about six months to complete the new design, and by early 1948 he was ready to produce the final version. Using his contacts in the engineering trade Sir Kenneth got a small number of parts made, and twelve units were assembled with the able assistance of his younger brother John. Like Sir Kenneth, John grew up in Walsall and went to Elmore Green High School. When the family moved to Wolverhampton, he finished his schooling at Wolverhampton Art College, and so was the 'artist' of the family. After school he became an engineer at Villiers and acquired the engineering skills that would become so important to the family business. The assembled units were sent as free samples to the leading photographic retailers of the day in the hope that orders would follow. 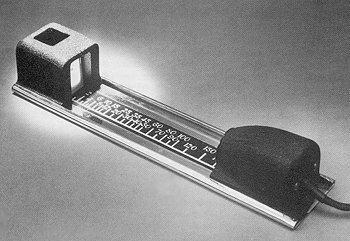 After a lot of consideration it was decided to call the device 'The Corfield Lumimeter'. Soon talks were underway with R. G. Lewis, one of the country's leading photographic dealers, which led to an order for 250 units. They first went on sale in 1948 at a retail price of �4.10s. John's artistic skills were put to good use as he produced all of the artwork associated with the product, including the various scales which were hand-drawn in black ink and then photographed by Sir Kenneth. The photographed scales were stuck on to the Lumimeter and varnished. The Lumimeter In use the light from a small part of a negative is projected onto a vertical screen in the reflex head at the top. Initially the lamp is turned off and the Lumimeter is positioned so that a dark part of the negative is displayed on the screen. A dial on the lamphouse is set to the correct paper speed and the lamp is turned on. In the centre of the screen is a luminous spot. The lamphouse is now moved to and fro until the spot just disappears. The exposure time can then be read from the scale on the baseplate. They were now faced with the difficulties of manufacturing the Lumimeters. The attic in Lonsdale Road was hastily converted into an assembly area and the coal shed became the press shop. A press had to be purchased as it was essential for producing the rounded edges on the baseplate. As Sir Kenneth and John were in full time employment, every minute of their spare time was now occupied in the assembly work.